Many of you may be wondering what is behind the title of this post. 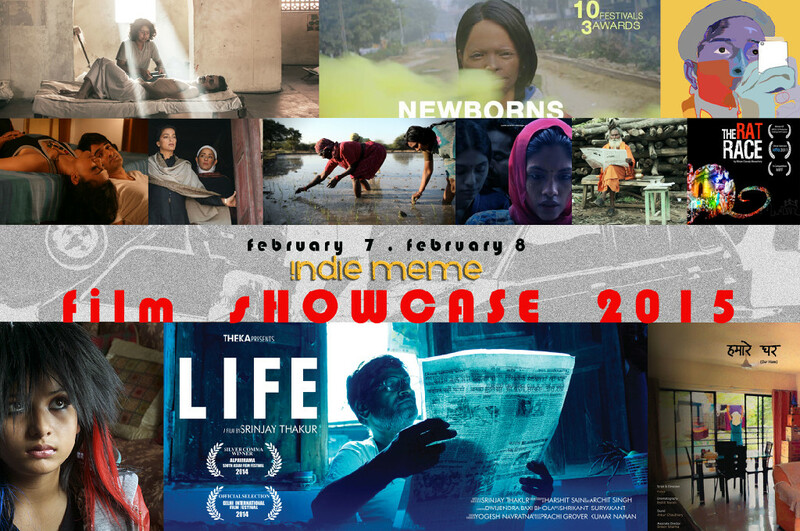 The Indie Meme Film Showcase is an event that is currently going on at St. Edwards University in Austin, Texas as I’m typing this. I’m not sure when this post will be going up, since I’m typing in-between screenings at the moment, but the event began on Saturday, February 7th, and ended on that Sunday at noon. As of writing this, I probably won’t be able to make the Sunday showcase, but I am here all day Saturday at St. Edwards. I was made aware of this event by some folks from the Austin Film Society after one of their screenings a few weeks back, and I’m technically here as a member as the press (which is a little foreboding and very cool at the same time). I took this gig not only as giving this website a little more of a boost (I’m a bit of an egomaniac that way), but the program itself sounded really interesting and cool. The Showcase is of films from South Asia, primarily India and the countries and regions surrounding it, including one film from Sri Lanka. These are not Bollywood films, far from it in fact. This is showcasing documentary features and shorts, as well as scripted narratives, and they portray South Asia as what it really is, not tip-toeing around the truth. That’s what excited me when I decided to cover this event, is that these are films that may challenge what we (we meaning the West) perceive this region of the world to be like. The best kind of films are the ones that can spark a dialogue with the audience, and this dialogue can change how we think, speak, and look at the world as a whole. Hopefully this introduction has gotten you a little curious as to what I’ve gotten myself into on this beautiful February Saturday. Instead of doing individual reviews for the films that I’m seeing, I feel that doing little mini-reviews (about a paragraph or two) of each film, shorts and narratives, would be best. Therefore I can give each film screened on this Saturday equal treatment and an equal amount of press. I hope you enjoy reading my rundown of these films, and hopefully they can inspire you to seek out these films. For more information, please visit www.indiememe.com/. The day began at 11 A.M., with the screening of a short film called Life. It was a 15 minute short film about a man living in a tiny village whose cell phone has been hacked (in a way) where he’s receiving calls about how to make a certain piece of Indian food. The short was a fairly simple short, but was a bit of a commentary on how the Indian people get crap like this on their phones all the time. There was a brief Q&A with the director behind the short, Srinjay Thakur, who discussed what inspired him to make this short. It was an interesting short, and if you can ever find the short and you’ve got some time to kill, you might as well kill it by watching this short. Right after that short was a film entitled With You Without You (no relation to any U2 or Beatles songs). The film told the story of a man who owns a pawn shop in a small village in Sri Lanka, who falls in love and marries a woman whose constantly coming to his shop to pawn off pieces of gold, in order to escape. It’s a tiny and intimate film that chronicles a marriage that maybe shouldn’t have happened, with the husband being a very quiet and lonely man due to his past, and the woman having a little bit of baggage of her own. It’s not uncommon to see films about doomed marriages, but what makes this piece particularly unique is of its setting in Sri Lanka (an area of the world that most of us aren’t use to seeing on film), and the very subtle political tension throughout the film. If you can ever find the film, I highly recommend that you check this one out. After about an hour-long break, I made myself back to the Jones Auditorium on campus to watch the second batch of films during the day. Once again, there was a short that played before the feature. This short was called Hamare Ghar, which was a half-hour short about a woman who is a full-time maid in an upscale Indian family home. The mother in the family is a fairly good woman who gives the maid old clothes and other sorts of gifts. But something is off with the family, as the mother does a similar trick with her daughter. It’s a fairly interesting short, which wasn’t quite as entertaining as the first short in the day, but was a very interesting commentary on social class in the Indian world. The feature right after the short was a film called Bidesia in Bambai, which was a story about the city’s music industry, with the film primarily revolving around a group of singers trying to make their way in a city that is constantly changing, sometimes for the best and sometimes for the worst. I’ll admit that the documentary could be a little slow at times, but it was always fascinating to watch a behind the scenes look into the world of Indian music. The film was much more than just that, as it was a commentary on music as a whole in the region, and how it can influence the people and the politics. It was a very interesting documentary, and its a subject that I didn’t even know existed. I chose not to stay for the screenings in the late afternoon due to fatigue, but from the glimpse of what I got into this world of Indian and South Asian culture, it was a rare and unexpected treat. I emensely thank the people of Indie Meme for inviting me to be apart of this series today, and I regret that I can’t make it tomorrow. However, if you can, you should go see the final couple of films screening tomorrow at St. Edwards if you live in the Austin area. Go to the link I listed above for more information on that.